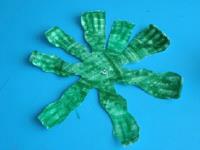 A tiny marine animal that children will enjoy playing with. 1. Gather your material. 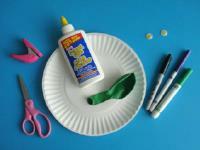 You will need a paper plate, white glue, a green balloon, a green marker, a purple marker, a black permanent marker, two wiggly eyes, a hole-punch, and scissors. 2. 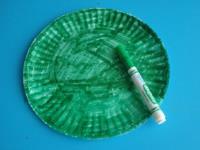 Use the green marker to color the paper plate. If you prefer, you may choose to paint it using green poster paint. 3. Cut eight tentacles around the outside of the paper plate as shown. Use the hole-punch (or scissors) to make a small hole in the centre. 4. 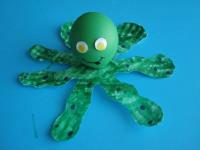 Inflate the balloon, but only enough to create a small octopus head. Knot the balloon. 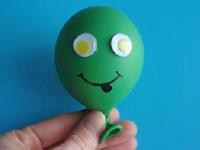 Use the permanent marker to draw a mouth and glue the wiggly eyes on the balloon. 5. Insert the knotted end of the balloon in the hole at the centre of the paper plate. 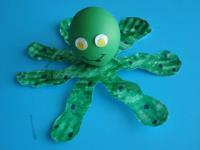 Draw tiny purple dots on the tentacles to complete your octopus-the perfect companion for little ones during your marine animal theme.